Liatris is commonly called Blazing-star, and is an ornamental plant. These are popular in summer for bouquets and live arrangements. The bright flowers are also used in gardens to create showy displays. This perennial plant blooms from early summer until the late fall. Many species are hardy and able to adjust to most soil conditions. Spikes appear on the plants which host many tiny flowers on each. L. aspera is a wildflower often called a Rough or Tall Blazing star. It is most often found in dry prairies and on the drier savanna. Other dry climates may also be home to this wild flowering plant. The average height is between two and four feet once it matures. Flowers form on an erect spike in dense clusters of purple blooms. Bloom pattern begins at the top and moves downward over the season. Flowers are available in late summer and early fall for this species. The seeds become ripe in fall, often in October through November. These seeds can be used to create other plants indoors or outside. L. cylindracea is known as the Ontario Blazing Star and Barrelhead. It is native to east and central North America and grows in prairies. Blooms open in mid and late summer and are often a purple or lilac. The heads of the flowers are dense with florets, up to 35 on each. This gives them a slightly rough appearance that many find attractive. Flower heads may appear singular or in dense clusters in some species. L. spicata is perhaps the best recognized of the garden varieties. Flowers are pink, purple or sometimes white depending on the hybrid. July and August are prime months for the blooms to appear and open. These plants prefer hot full sunshine in order to grow their best. A spot that receives a full day of sunshine and no shade is ideal. Shade can limit growth and may lead to spindly stems and low blooms. Well drained soil is necessary as rot can occur quickly in plants. Soil can be enriched by adding material such as compost or sand. The additives needed will often depend on the soil's natural state. These liatris attract bees and butterflies, making them popular. These may be planted alone as a type of landscaping or path liner. They may also be mixed with other butterfly attracting flowers. Watering is important for the first two months this plant is added. Over watering should be avoided as rot and mildew can spread rapidly. After this initial period, many species will survive on their own. Drought resistant hybrids can be used for areas that are dry often. In climates of heavy rain, it may be best to plant them in containers. Containers may need to be moved out of heavy rain in order to drain. Liatris can be found in either plant form or in cut bouquets in places around College Station, TX, Waukegan, IL, El Monte, CA, Knoxville, TN, and Salt Lake City, UT. They can be applied to certain bouquets to provide a small variety of expressions. This flower often represents a desire to try again or an apology. This makes them popular for an "I'm sorry" bouquet or arrangement. They may alsoms to represent tenderness or delicate beauty. This is often due to the slightly tender and whispy appearance. 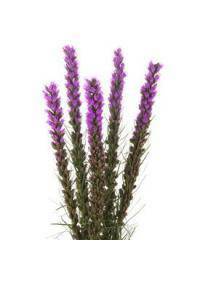 Liatris blooms are a popular choice for dried arrangements as well.